Ducks Unlimited Canada, the City of Ottawa, the Government of Canada and several private donors have joined forces to ensure that a 178 hectare (440-acres) property, located in the southern portion of the Carp Hills landscape, will remain pristine for wildlife and for people – now, and into the future. 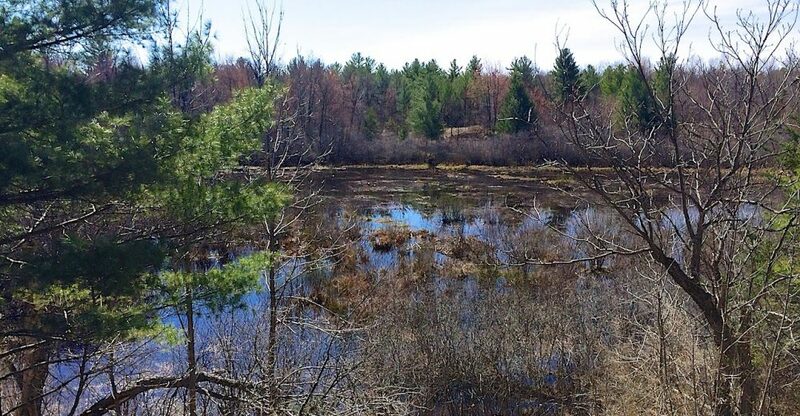 The Carp Hills property is a mixture of provincially significant wetlands and associated upland habitats of forest cover and grasslands situated amidst unique Canadian Shield rock formations and surrounded by fertile agricultural lands. The property is adjacent to existing conservation areas creating a natural corridor that supports and connects wildlife habitat – Carp Hills is renowned for its high biodiversity of flora and fauna, including species at risk like the Blanding’s turtle, a species listed as endangered under the Canada Species at Risk Act (SARA). In addition, people have been hiking and skiing the back country trails for many years. The area is also a candidate for consideration as an Area of Natural and Scientific Interest provincially. This is the largest natural area acquisition with the City of Ottawa since its amalgamation, and the timing couldn’t be better. Ducks Unlimited Canada will manage the land for its natural values with the Friends of the Carp Hills – the organization that is currently managing the adjacent Crazy Horse Trail, a popular community destination for hiking and cross country skiing. The property will continue to be accessible for low-impact, public recreational use. In fact, the public is encouraged to be part of the process – a Town Hall event where local residents and other interested individuals can come out and learn more about their new neighbours and provide input on plans for the property is scheduled for May 9th, 2018, 7:00pm at Carp Memorial Hall. More details to follow. In addition to being a valuable natural resource, areas like this contribute to public health, community enjoyment and property values, while keeping the City’s overall ecological integrity and aesthetic enjoyment open to all. The Carp Hills project is supported by funding from the Government of Canada’s Natural Areas Conservation Program (NACP). “On behalf of my colleague Catherine McKenna, Minister of Environment and Climate Change, I am very proud to support the conservation of 178 hectares of wetland habitat in the Carp Hills. We support the conservation and protection of ecologically sensitive areas through the Natural Areas Conservation Program and with the help of our partners and donors.” -Karen McCrimmon, Member of Parliament for Kanata—Carleton. Ducks Unlimited Canada and the City of Ottawa would like to thank the project partners and donors for making this project a success, including the Nature Conservancy of Canada, administrators of the NACP. The Nature Conservancy of Canada (NCC) is the nation’s leading not-for-profit, private land conservation organization, working to protect our most important natural areas and the species they sustain. Since 1962, NCC and its partners have helped to protect more than 1.1 million hectares (2.8 million acres), coast to coast, with more than 74,400 hectares (184,000 acres) in Ontario.